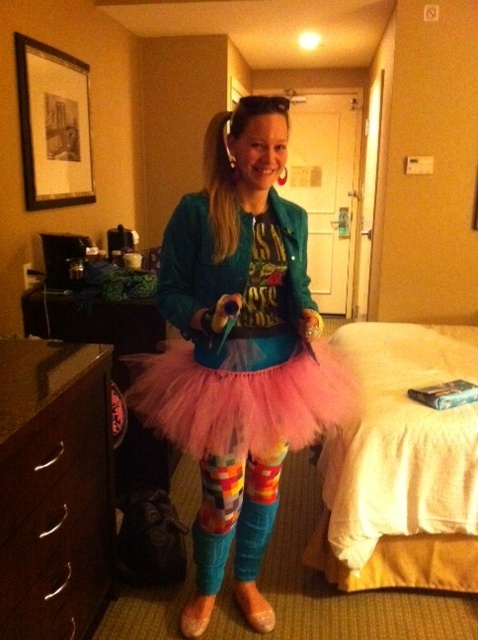 Remember how I said that we’d fit right in at the 80s show, wearing outfits like this? Well, we did. For the most part. There were some other people in wayfarers; some rocking side ponytails; plenty more wearing leg warmers. But I didn’t see a single soul in a tutu (outside of our group, of course). And here’s the thing: did we feel ridiculous in all that tulle? Of course! But was it completely worth it? Without a doubt. This is what happens when you don't take into account the flavor of your ring pop. Stupid purple mouth. And I picked up a few pointers while wearing said tutu that I’d like to pass along – just in case you ever find yourself in a similar situation. Wearing a tutu does not automatically make you as graceful as a ballerina. Trust me. Peeing while gathering all your tulle is truly an art form – tricky at first, but necessary to master for a successful night. Tutus overall are a conversation starter. Men, women – everyone wants to know why and where you got them. Some women will even ask permission to steal the idea for their own bachelorette parties. Steal away, ladies. Final verdict: The bachelorette party was a huge success. 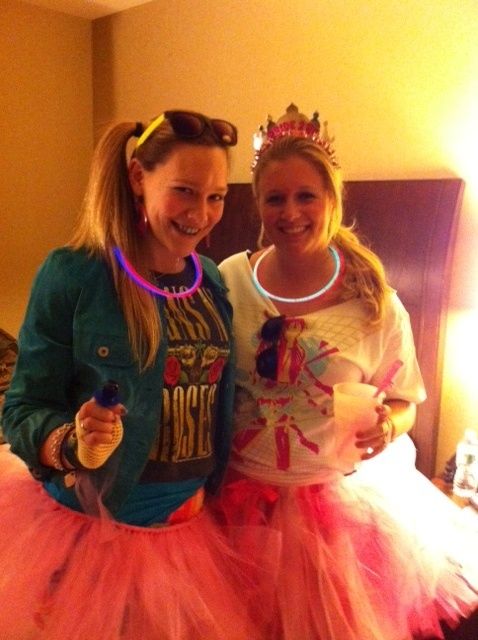 The bride-to-be had a blast and we all rocked our 80s style. Plus, I now have a ready-made costume for next Halloween. Who ever said tutus were just for one-time use? Well, if you guessed that they’re all things I’ll be wearing this weekend for an 80s themed bachelorette party, you’d be correct. Plus some ridiculous jewelry, maybe a headband, and some over-the-top makeup. And while this might look slightly out of place if we were just traipsing around New York (where the party is), I think we’ll all fit right in when we go see Rubix Kube: The Ultimate 80s Tribute Band. 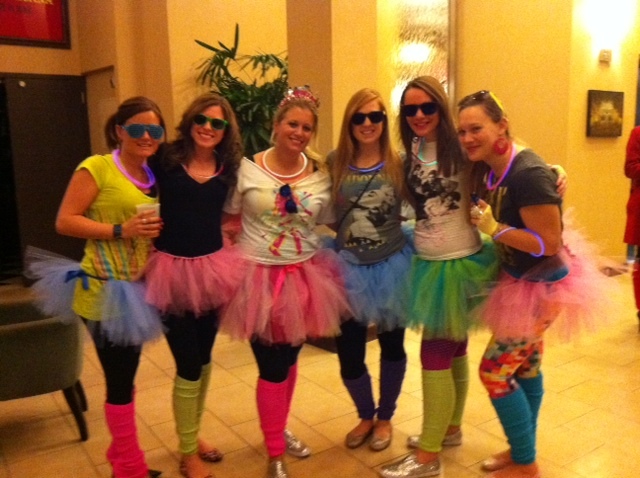 I admit that I was initially skeptical about an 80s themed bachelorette party, but trying those leggings on really put me in the mood. Plus, now I can’t wait to bust out my crimper again. 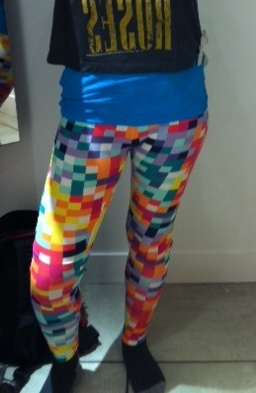 What would you add to an 80s outfit? You can never have too many accessories. It’s not every weekend I get to check off two things on my 25 list, but this jam-packed weekend was quite the exception. First of all, THANK YOU to everyone that donated, cheered, or otherwise supported. You guys are awesome. As for the run itself, I think liberating might be the best word to describe it. I was, of course, nervous at first to disrobe. Even with the support (in both words and shots) from Memo and Cashew. But once we started running – down Pennsylvania Avenue and around the Capitol – it was actually quite freeing. I couldn’t help but smile the entire way. And even after the run was over, that little liberating high hung around and encouraged me to remain pantsless for the better part of the day. Don’t knock it ’til you’ve tried it. Thanks again to Cashew and Memo for coming out; I don’t know what I would have done without you ladies. And I can’t wait to have you run it with me next year! 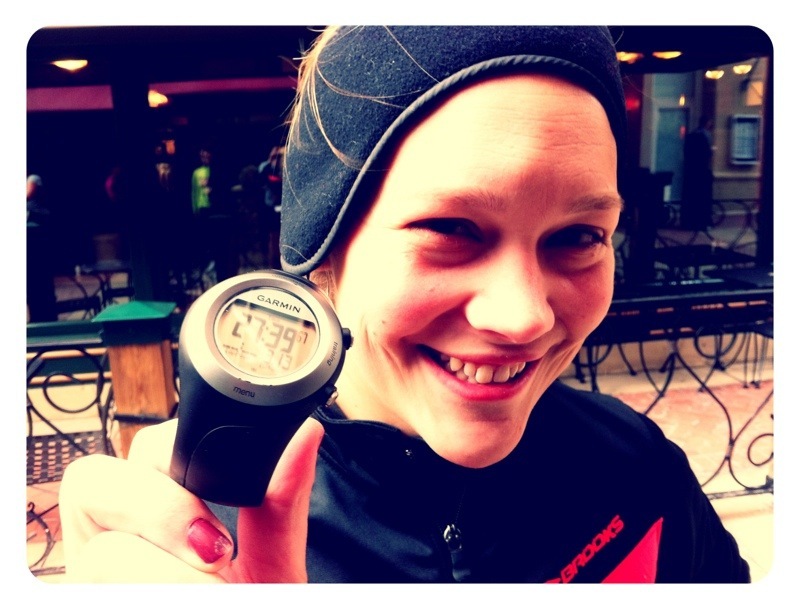 One of my other goals was to run a race with an average pace of under 10 minutes. I haven’t done that since October of 2009. Frankly, this was the one goal that I wasn’t sure I’d be able to complete at all; I considered it a bit of a stretch. 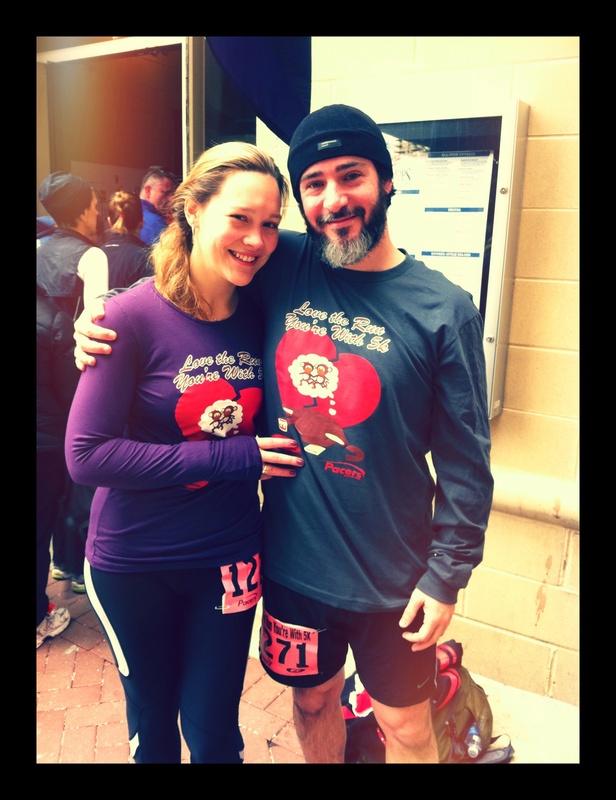 But yesterday the boyfriend and I ran a 5k in Arlington and he promised to pace me, since he was so sure that I could do this. 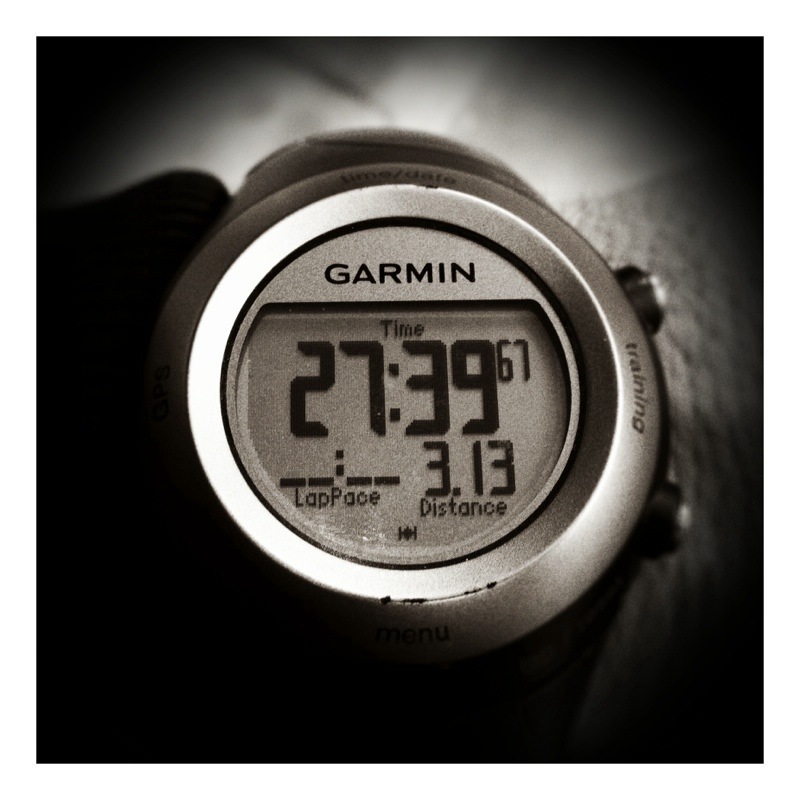 I had somehow managed to forget Guillermo (my Garmin) that morning, so I had to rely on the boyfriend for pace. I couldn’t just let him get ahead of me and hope to still make my time goal of 28 minutes. And so I stuck with him. Even as I was cursing this plan in my head, and singing panting along to my iPod out loud. I beat my goal by a whole 21 seconds! It sounds minimal, but it’s actually huge. Especially for me. This will sound cheesy, but having the boyfriend pace me and help me reach this goal is honestly one of the best Valentine’s Day presents I could have gotten. Please. Like I would have posted today without at least a little bit of shmoop. I admit it: this was harder than I thought. I didn’t have 50 big things I was willing to part with. And I disagree with the idea of throwing out duplicates just because. When I run out of shampoo/toothpaste/lotion/floss/etc. I’m going to be glad I have more on hand. So, that said, I’m sure there are more things I could toss, but I did get to 50. It might not look like a lot from the photos, but it certainly felt like it while I was collecting. 1. Old econ slides – I never need them again! 2. A folder with old apartment papers and a copy of the lease I signed 3 years ago. I already have my security deposit back; I think I’m okay. 4. Old grad school applications. 5. Sign-up sheets for tournaments from the camp I work at each summer. Seriously – why do I have these? 6. Running information from races that I did in 2009. Unnecessary. 7. A skull. I got it at a white elephant party in 2009. I don’t know why it’s still around. 8. 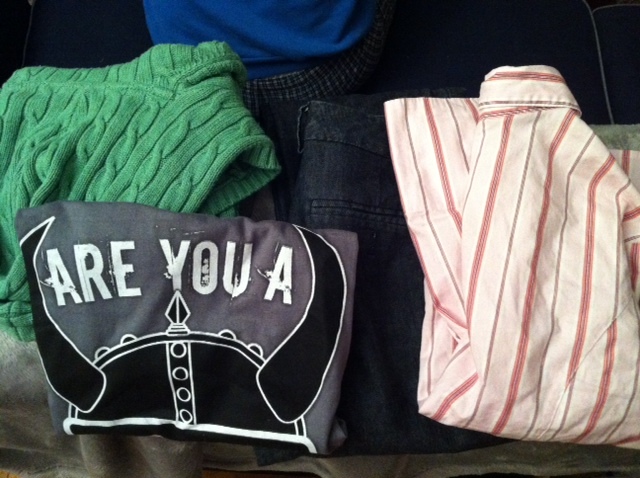 Green sweater – never wear. 10. Denim slacks – rarely wear and no longer flattering. 11. Striped button-up shirt – too short and too tight. C’est la vie. 12. Pink cell phone case – no longer necessary. 13. Snow globe perfume – never wear. 14. Rusted shut kitchen scissors – unusable. 16. Makeup – never use. 17. The basket and candy that came with it. 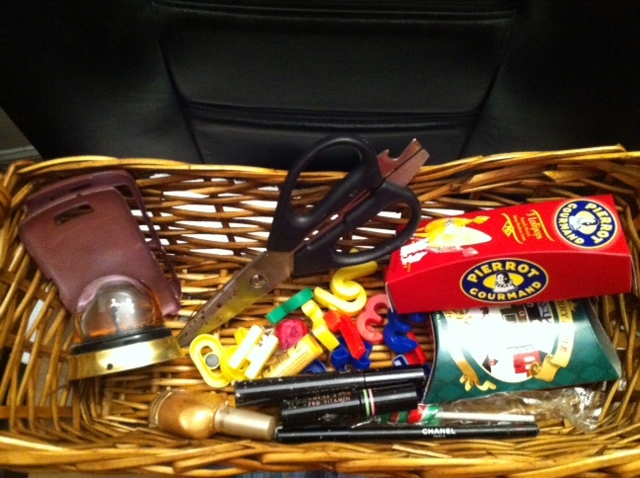 I usually keep baskets like this because, you know, they’re good for something. But not anymore (this time). 18. Stand up mirror – never use. 19. Old phone charger – I don’t even know which phone it belongs to. 20. Lanyard – never use. 25. A journal of academic papers that I’ve never even read through. 27. Some sort of running tape that I got in one of my race packets. I held on to it “just in case” but have never used it. 28. Army 10-Miler hat – never wear. 29. Travel mug – never use. 30. Notepads, originally from a stocking stuffer (sorry, Mama). 33. Hairbrush – I don’t need three. 34. Another running goodie that I’ve never used – presumably it adds extra storage space for your keys or what have you. 35. The box. 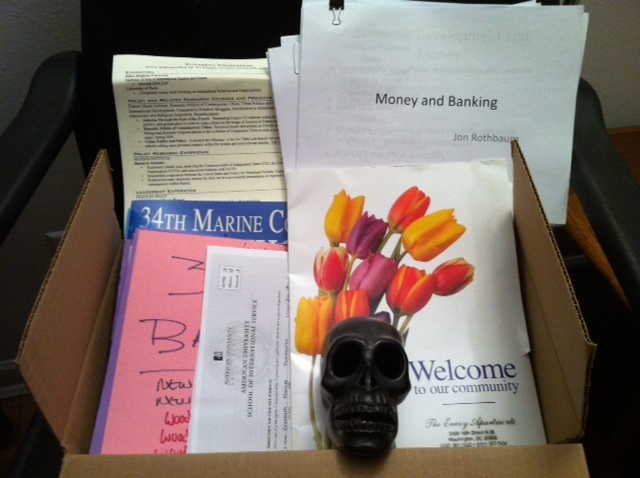 I’ve kept that box since I moved to the area in 2007. “It’s a good box for storage,” I thought. Well, maybe if I didn’t have so many things to store, I could rid of the box, as well. So I am. 36. Faux Burberry belt – never wear. 37. Little jewelry bag – I have two. 38. Navy dress pants – too high-waisted for me. 39. A puck. I don’t know. 40. Purse – never use. 41. Skinny black belt – never wear. 42. Magazines – from 2009. Time to go. 43. Bag of race goodies (on the left). There are eye drops, mints, coupons, etc. in there. Same things from every race and every time I fail to use them. 44. Old beat up binder. 46. 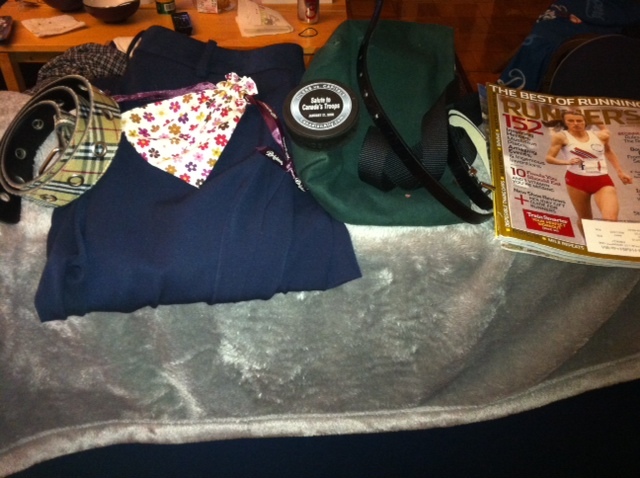 Over sized tote/grocery bag (plenty more where that came from). 47. 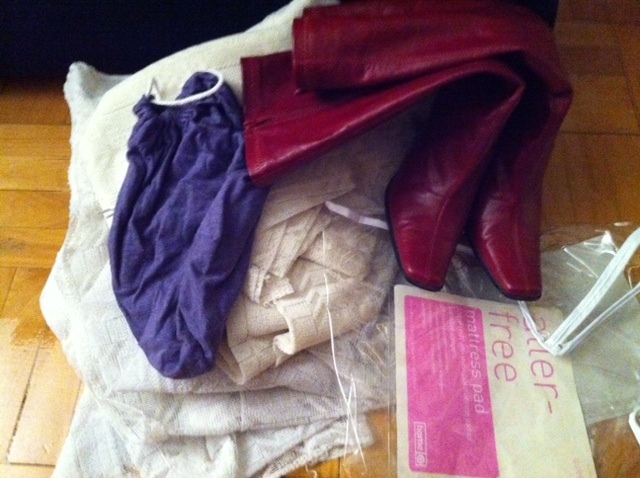 Storage bag for jersey sheets – unnecessary. 48. Curtains – don’t use. 49. Old mattress pad bag – unnecessary. 50. Red Wonder Woman boots. The “leather” is cracking and they’re no longer pretty. Very sad. I’d like to say I’ll do this once every few months or so, but let’s be realistic: I probably won’t do it until Cla challenges me again. It’s exactly how it sounds. 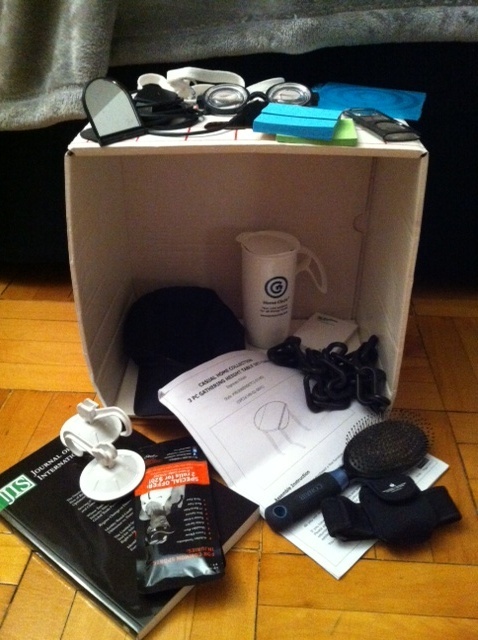 Throw out 50 superfluous items around your home, counting like items as one (i.e. 20 magazines equals one item). Now, Cla knows first hand how much trouble I have throwing things out. And I know, first hand, how hard it is for her to walk around my apartment and not end up with a pile of things to toss. It takes willpower on both our parts. However, this is still something I need to do, probably once a season. And there’s no better way to get me to do something than to challenge me. I’m giving myself to the end of this week, since I know how long it may take me to part with this knick-knack or that trinket or some other memory. But come Saturday, the apartment will be 50 items more spacious – which I’m pretty sure will help with overall stress levels. Wish me luck, and let me know if you, too, feel the desire to participate in your own 50 item purge. 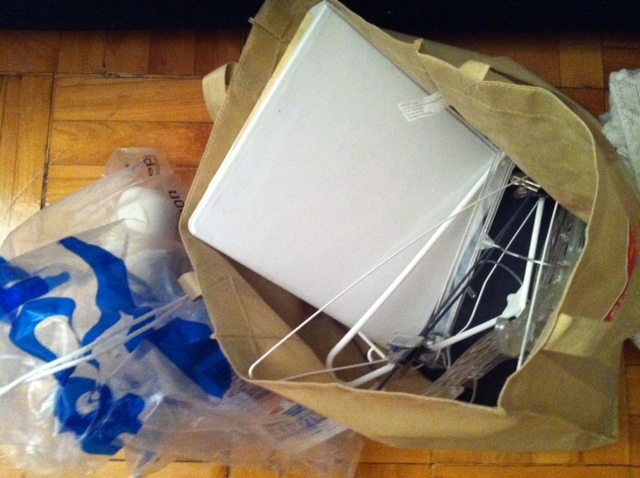 Or am I the only one who needs a challenge (and, apparently, accountability) in order to get rid of my belongings? 1. There’s no such thing as leftovers. As a single gal living on her own, I often cooked in bulk. There was the soup craze of Winter ’08, where I brought the same stew in for lunch every day. There were also casseroles and pasta dishes that could last anywhere from 2-4 meals. That is no longer the case. Whatever we make, regardless of suggested serving size, is gone by the end of dinner. On the one hand, this is good. It means a) that the fridge isn’t stuffed with food we’ll forget about, and b) that the boyfriend likes my cooking. On the other, it means lunch just got a little more expensive. 2. I no longer have custody of the remote. 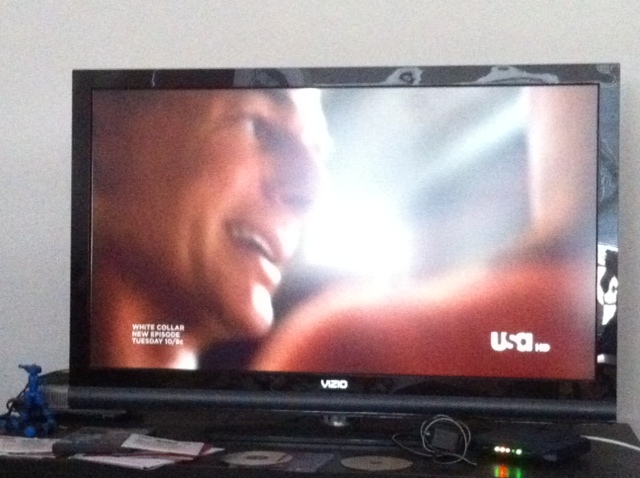 Why yes, that *is* NCIS. I can probably count on one hand the number of times I’ve controlled it. Okay, maybe two hands. Sometimes he hasn’t been home. Usually this is fine. I’m not that picky. But we have had this conversation more than once. 3. Getting ready in the morning is much more fun when accompanied by a duet. Regardless of who gets up and showers first, we’re both scurrying around in the morning about the same time, and we always have music on. I am an unapologetic shower singer, but never has it been more fun than when I hear him join in on the other side of the curtain. Every couple has to make adjustments when they consistently share a bed (or anything, really). Some people are sprawlers; some hog the blankets; some throw the blankets on you, so you wake up sweating at 3am; some sleep with elbows out, as if always in attack position. I call all of these people the boyfriend. I have grown quite fond of my sliver of our queen-sized bed. And I have nearly perfected my “jab and shove” so that he rolls over (and takes his elbows with him) without much effort. But it’s still an art. And there are still some mornings that I wake up with an elbow in my eye. 5. The cliches are true: coming home to someone you love immediately makes a long, hard, stressful day infinitely better. Especially when that someone you love has also made you dinner. It makes the bed wars that much more manageable.